lagoon has been computed using an Eulerian approach and a 2D hydrodynamical model. capacity of the Nador Lagoon has been investigated when forced by the astronomic tide. computed for two scenarios during winter and spring periods. anthropogenic inputs that modify both the trophic state and the health of the whole ecosystem. Several parameters forcing water circulation in the lagoons, gulfs among them swell and tide. volume between the embayment and the receiving water body of the Mediterranean Sea. demonstrated that process of tidal exchange is inversely proportional to the residence time. and the influence of the return flow on this basin have to be into account. inlet, Bokhana, through which exchanges with the sea occur. urban/industrial wastes of the Selouane village into the lagoon during the wet season. is the coefficient of wind and w = ( wx , w y ) is the velocity of wind. the reader is referred to the works [6, 7, 8, 9]. the particle residence time [12, 13, 14, and 15]. Takeoka [16, 17, 18, and 19] known as the remnant function. The decay of the concentration C is exponential i.e. concentration to 1/ e of its initial value. A complete description of the model may be found in . embayment and the strength of the inlet flow relative to the strength of the coastal current . C0 (x,y) = C(x,y,t=0) = 1.
observed sea surface level inside lagoon, caused by tide. Figure 1: Sea surface elevation (SSE) of Nador lagoon observed during year of 2014.
summarizes some parameters used in the simulation scenarios. Table 3: Parameters of the hydrodynamic model. 4.1. Impacts of the tide on residence time. they do not emerge during the various tides. Figure 2: Nador lagoon area and residence time measured nodes of the two confined region. set to zero, assuming that the incoming tide contains clean water. tide is always a little bit higher that the other one. condition in all inlet nodes ∂X / inletnodes = 0 ; for both cases entering and exiting water. re-entering water has been taken into account. Figure 5: Residence time values comparison between return and no return flows cases. the north and south respectively, and 5 days for most of the lagoon. 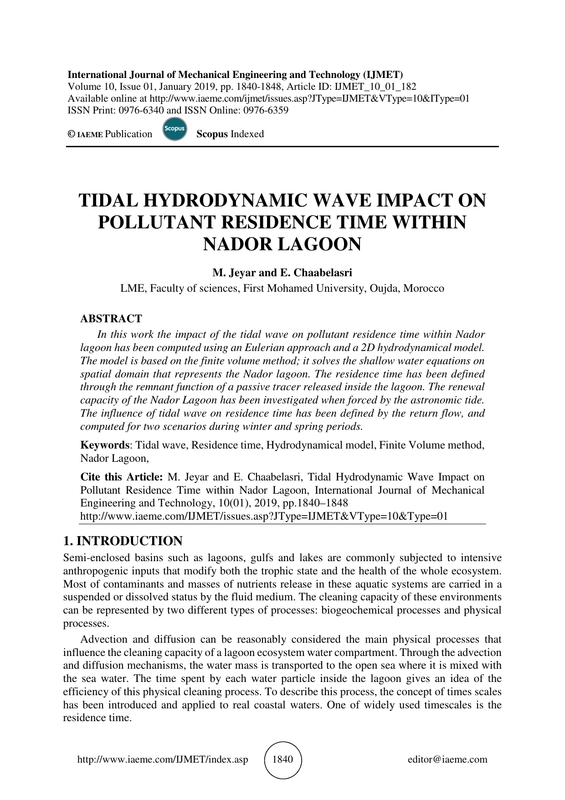 Figure 6: Residence times distribution in Nador lagoon in two cases: Return and non-Return flow. Figure 7: Residence time values comparison between return and no return flows cases. Transport by Water Flow, Math.Comp. Simu.79,3415-3423(2009). source-term balancing in shallow water equations, Computer Meth.App.Mech. Eng., 199,4952, 3324-3335 (2010). Numerical Survey of Contaminant Transport and Self-Cleansing of Water in Nador Lagoon. Awbi HB. Ventilation of building. London: Chapman and Hall; (1991). indices to evaluate the air quality of urban areas. Bui.Environ. 2008; 43:1991e (2004). Danckwerts, PV. Continuous flow systems: distribution of residence times.Chem. Eng. Sci. Agmon, N.: The residence time equation. Chem. Phys. Lett. ; 497:184e6 (2010). Ghirelli F, Leckner B.: Transport equation for the local residence time of a fluid. Chem. Eng. Takeoka, H.: Fundamental concepts of exchange and transport time scales in a coastal sea. inlet relocation , International Journal of Fluid Mechanics Research, Vol. 42, No. 5, (2015).